I thought that I would just express a few thoughts that I have about my (fairly) new Toshiba Tecra laptop that I received at work. As a PC user and a developer, I am always torn about the idea of getting a new computer. The excitement of having a fresh new computer chalk full of the latest technology is really what it's about, that part is fun! But the thought of having to setup the computer with all my necessary software does seem daunting. These days just about every PC maker stuffs their computers with pre-loaded software. I can't stand this. Upon first booting up the computer, there are more than a dozen different programs running in my task bar, just eating up my memory and slowing the very first load time of my brand new computer. 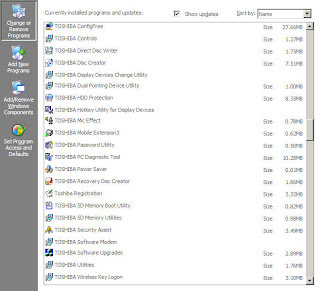 Not only do I have to go through and uninstall several programs that I'll never use, but when I encountered "Toshiba " in front of most of the pre-installed programs, I had to think twice about removing them. Upon further inspection, I'm stuck with most of them. That is, at least if I want to use my volume control on the laptop. Or if I want to use my microphone. Or if I want to use the Fn + anything functions that come with the computer. Or if I want to use my WiFi. Or if I want Toshiba to manage my batter power. Or .. or ... or any number of other things. What does that mean? Slower boot up times when I log into Windows. We already all know that loading windows takes longer every single time you boot up your computer. Also, that means that I can never turn my computer on without the Windows (and every other program) making it's start up sound because my Toshiba volume control software isn't loaded yet. (Yes, I realize I can turn off these sounds, just let me vent some more, then I'll disable them). Also, why can't I just manage my multiple monitors through Windows? Sure it's not the best monitor management, but at least I've figured out how to do it. Now that Toshiba has built in their own, that means the two often don't play nicely. If you try and change the settings in Windows, but the Toshiba setting is wrong, it won't stick. Furthermore, even though this isn't just Toshiba, but every other PC laptop maker, why can't there just be a standard keyboard arrangement? Just after I'd gotten used to the placement of my Delete key on my Dell M65, now it's in an entirely different place on every laptop. "Designed for Windows XP" -- ha! If they designed it for Windows, maybe they could have kept in mind that you have to press Ctrl + Alt + Del to login. I really do appreciate my new computer, don't get me wrong. But it often takes more effort to manage it than I'd like. I'm past the point of geeking out and over-clocking my CPU. I just want it to work and I want it to be fast, because as a developer - we really do need that extra horse power. I can't put all the blame on Toshiba, but so far I like Dell's computers much more than most others. Apple laptops aren't completely void of this sort of long-armed consumer frustration. When I install OS X for the first time, I usually take off iWeb and the Microsoft Office "Quick Start" and the iWork trial. Of course, you could get a Macbook Pro with Boot Camp and Vista on it and split the difference! Hi Mase, found this post while doing research for my company. I'm curious: had you considered just doing a clean install? Or is that too much of a hassle, say, even if you collected all the pertinent driver information? Also, since I'm working with Toshiba on a virtual helpdesk website, would you mind if I shared this post with them?